The CAHFS Daily News is a food safety news feed from the Center for Animal Health and Food Safety (CAHFS) at the University of Minnesota. It is a daily email delivered to your inbox Monday-Friday. The news feed provides a brief outline of current events in local, national, and international news. UMASH is pleased to announce the addition of a bi-weekly agricultural worker health and safety news segment. The bi-weekly section will be sent every other Tuesday and it will be in the same format as other sections in Daily News. The first agricultural worker health and safety issue was sent February 14, 2017 (see a sample of the first email at the bottom of this page). UMASH is excited about this partnership with CAHFS. Agricultural worker health and safety is an integral part of the overall food system. Without healthy and safe workers, we cannot have a healthy and safe food system. To subscribe to the Daily News listserv, send an email to LISTSERV@LISTS.UMN.EDU, leave the subject line blank, and write “SUBSCRIBE CAHFS-DAILYNEWS Your Name” in the body. 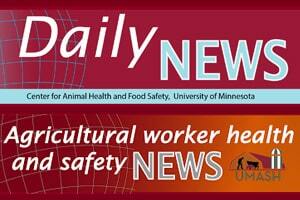 To subscribe to only the bi-weekly agricultural worker health and safety news, send an email to junk0011@umn.edu. Montana’s produce farmers are being offered training in good agriculture practices (GAP) in March. Food safety experts will be leading three workshops focused on guiding growers toward establishing food safety plans. This workshop will teach food safety, mitigation techniques, how to implement food safety measures, and general guidelines of the Food Safety Modernization Act. Researchers at Colorado State and Kansas State Universities author article confirming US livestock species do not host zika virus (unlike non-human primates). This is good news for people living around or working in animal production among Zika affected regions, since they won’t need to take further protective measures. This doesn’t mean livestock producers should avoid mosquito control, because standing water in troughs and drainage areas can be ideal for Aedes mosquitoes (which transmit Zika virus to people). The fall in oil prices has impacted the economy in Venezuela, which is at a critical low point, severely limiting food and medicine availability. Some Venezuelans are turning to harvesting vulnerable wildlife (and feral animals) to meet their nutritional needs. Scientists are raising concern that these supplemental food items are more likely to pose health risks from viruses or bacteria that could lead to human disease. Questions, comments, feedback about today’s Daily News? There was a work-related accident at a Perdue Poultry plant in Delaware. The accident involved a female associate who suffered serious injuries to one of her arms that required hospitalization. Another work-related accident occurred on the same day at the nearby Mountaire chicken processing plant. A study was conducted to assess strain and ergonomic needs in farmers with disabilities with work induced strain being measured by heart rate, muscle activity, and the rating of perceived exertion. At the conclusion of the study, all participants had some form of work that they were unable to perform, but the farmers with disabilities were still able to perform work-related tasks considered to be of light or moderate strain. Some of the most important ergonomic changes that were needed during the study involved ergonomie redesigning of tractors that allowed the farmers with disabilities to perform work-related tasks with less strain. Agriculture is the most hazardous industry in Minnesota according to the Minnesota Safety Council. The Minnesota Safety Council provides many resources to the public regarding safety in agriculture-related work including brochures, Federal OSHA Farm Safety Fact Sheets, studies, and sources from UMASH. There is also an opportunity for employers and farmers to qualify for up to $10,000 through the Safety Grants Program for projects designed to reduce the risk of work-related injury or illness in agricultural work. Questions, comments, feedback about today’s UMASH Daily News?